With this package you will visit some of Brazil’s top 3 most sought after destinations –Rio de Janeiro; Iguassu Falls and the Amazon. Rio de Janeiro is a fantastic city of amazing natural beauty and where lively Cariocas live in a combination of work and relaxation, meeting at the end of the day on the city's stunning beaches to watch some live music, exercise or jung hag around. Rio´s granite mountains surrounded by green forrests and deep blue waters make it one of the most beaufitul cities in the world. What amazes us about the Iguassu Falls is their sheer size, over 3km (1.9 miles) wide and 80m (263 ft) high, their beauty is unsurpassed. The misterious Amazon gives you another perspective of life. Everything lives in the forrest and the river. When you see the Amazon, you understand that we are just a tiny grain in the world and that the planet knows how to survive. It is an amazing feeling to take a small canoe into the river and see some of this incredible wildlife. We have chosen Jungle Lodges that offer walking trails, bird watching tours, boat tours, jungle night treks and survival tours. This package offers privately guided city tours as well as nature tours to some of the most amazing sites in Brazil, whilst staying at very comfortable and relaxing accommodation in lodges, hotels and pousadas. Easy. All ages are welcome. The walking tours to see the falls require climbing up and down steps to get a good view of the falls. Tropical weather and direct sunlight demands sun protection and plenty of fluids. At arrival in Rio de Janeiro airport, a private English speaking driver will take you to your hotel, where you will check in. If you are hungry, we can suggest a number of lcoal restaurants. We su...You will arrive in Rio de Janeiro and be met at the airport by a private driver who will take you to your hotel. After checking in, you may want to relax and have some lunch. We suggest lunch at Porcao, a Brazilian barbecue buffet restaurant. 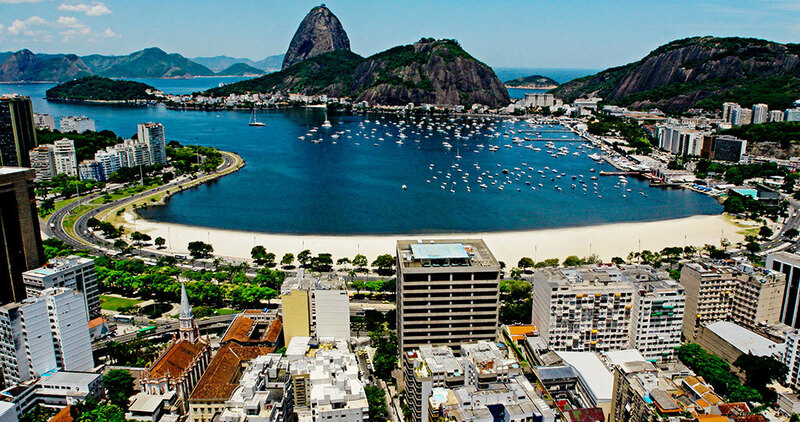 In the afternoon you might like to explore around Copacabana and visit the famous beaches near your hotel. After breakfast, we will go on a city tour by Land Rover to seee some of the best highlights of Rio de Janeiro. We will drive along the scenic route of Castorina road toward the Corvocado (Christ statue). We will then stop by to see the Mesa do Emperador (the Emperors Table) and Vista Chinesa (Chinese lookout point), before we enter the Tujica National Park. We will be able to see the importanty sites of the park including the Tauney waterfall, the Mayrink chapel, and see the beautiful flora and fauna as well as exotic Atlantic wildlife. We will then drive to the top of the mountain in the direction toward the Corvocado, and see amazing 360 degree panoramic views of Rio de Janeiro. Next, we will stop by the neighborhood of Santa Teresa, a historical district in Rio where many artisans live and work. We will have lunch in one of the many local restaurants and experience some excellent Brazilian cuisine. 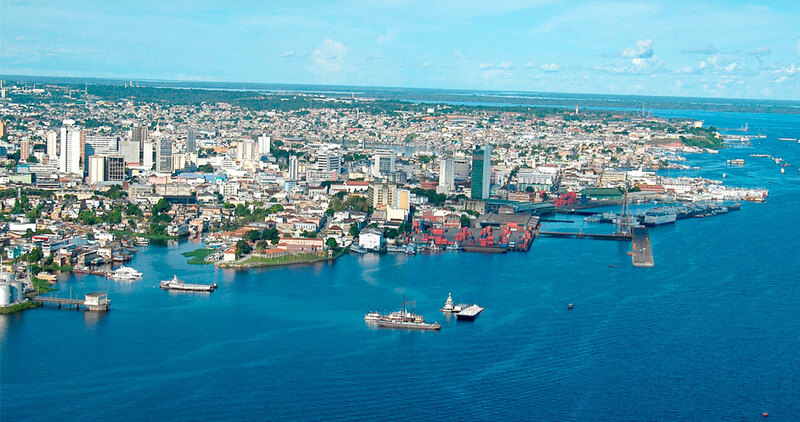 After lunch, we will visit the Chacara do Ceu Museum and see views of Guanabara bay and the incredible landscape. We will end the tour at Sugar Loaf where we will watch the magnificent sunset over the bay and city. We also suggest dinner at Da Brambini (Italian Seafood) at Praia do Leme. Explore Rio de Janeiro at your leisure. If you happen to be in Rio on a Sunday, the hippie fair (open-air handcrafts market) at General Osório in Ipanema is worth a visit. There is an evening dinner show (Samba show and dinner) available, if you are interested, which is not included in the above package. Please let us know if you would like us to book this for you. On your final day in Rio, you must check out of your hotel around 10:30 a.m. and say goodbye to this marvelous city,’ then be driven in a private, air-conditioned vehicle to the airport to catch a flight to Foz do Iguassu. At the airport in Iguassu you will be met and driven to your hotel, where you will check in. We suggest dinner at the Restaurant Clube Maringá – their specialty is fresh water fish from the region. Your second day at the falls will comprise a full-day tour of both sides of the falls. First, you will be taken on a 3-hour tour of the Brazilian side of the falls by a private English-speaking guide. You will follow a trail inside the sub-tropical forest, which includes a visit to the bottom of Salto Floriano (Floriano Falls). During the walk, there is an impressive view of the Devil’s Throat from a bridge. At the end of your tour an elevator will take you up to the top of the falls. After your tour of the Brazilian side, there will be a break for lunch. Lunch is included in your package and you can choose from the following list: Bufalo Branco Churrascaria or Churrascaria Rafain (grilled meats with a mixed salads buffet), MaringÃ¡ (good variety of seafood and sushi), La Mamma Galeteria (Italian food), Porto Canoas (grilled meats, pasta dishes, and salads). Then on to see the Argentinian side of the Iguassu Falls (4-hour tour). 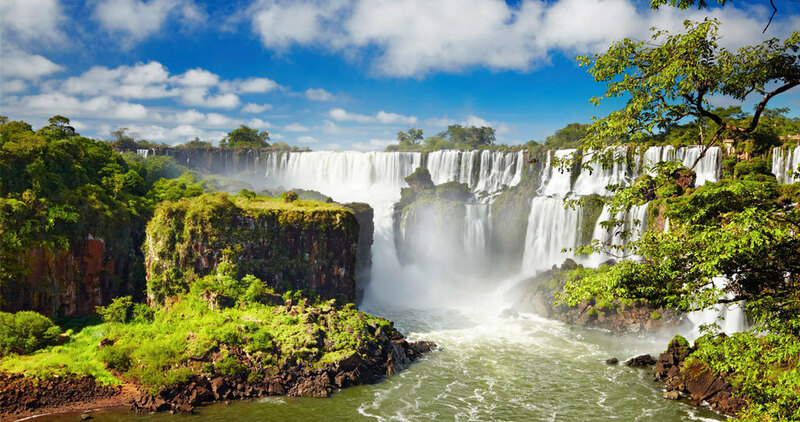 You will be taken across the border into Argentina by private vehicle, into the Parque National del Iguazu, 40 km away from the Brazilian border. Once in Argentina, you will go on a walking tour of the falls. The views are magnificent, especially the one right on top of the Devil’s Throat, which is reached by a little boat taking you through breathtaking scenery. 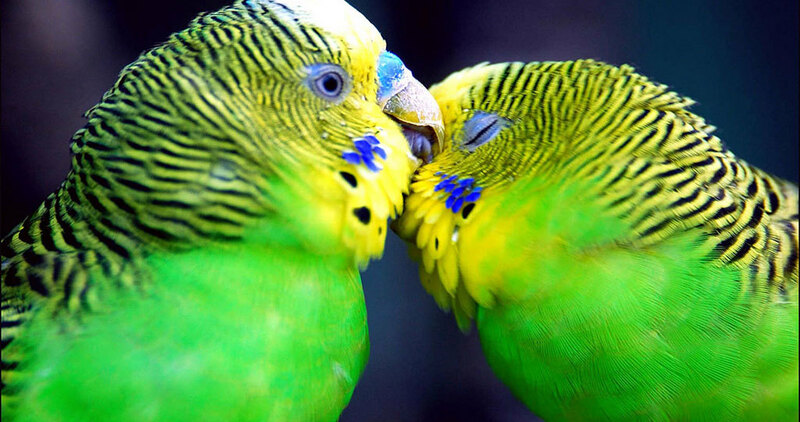 Throughout the day you will see numerous rainbows, hundreds of beautiful butterflies, lots of friendly little South American coatis, and dozens of exotic birds. (The entire tour takes about 8 hours). After breakfast on the last day of your trip you will be taken on a tour traveling the Macuco Trail in a rustic, open wagon, which allows you a view of the luxurious jungle in all its splendor. Our guides will explain some of the stories, marvels and mysteries of the sub-tropical forest surrounded by orchids, bromeliads, and thousands of butterflies. You will take a walk down the Iguassu Canyon Trail, visiting the picturesque Macuco Falls and enter the Brazilian jungle on foot to have more close contact with nature. Finally, you will ride the rapids of the Iguassu Canyon in secure open boats (mild Rapid). This 3-hour tour gives you a unique and different view of the Iguassu Falls. 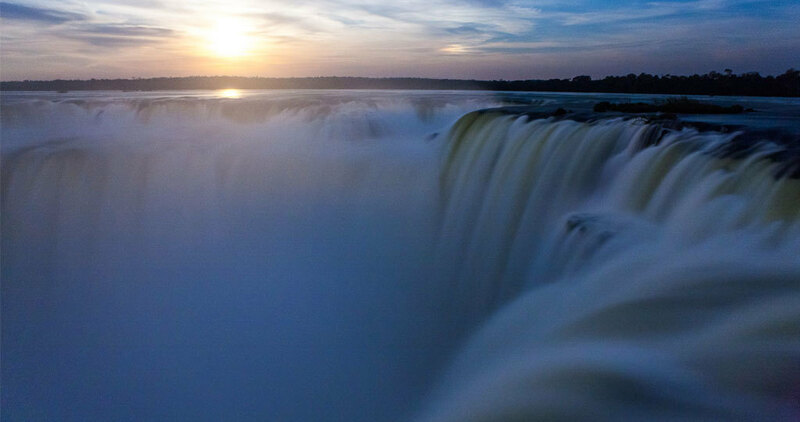 Before checking out of your hotel, you may want to have one final look at the magnificent falls, before be driven in a private, air-conditioned vehicle to the airport. From Foz do Iguassu, you will fly to the Manaus airport, where you will be met by a representative of the Anavilhanas Jungle Lodge and taken to the lodge. After checking in at the lodge, you will have dinner and be taken on a reconnaissance tour through main infrastructure lodge followed with one hour jungle night trek. Today’s tour after breakfast is a jungle trek with emphasis on the Amazon’s ecosystem by showing the diversity of trees and plants. After lunch you will depart to one of survival camps where the night will be spent and from where a nocturnal trek is organized. After a delicious breakfast you will be taken on a full day Amazon River trip. A bus will takes you to southern extreme of lodge (40 minutes) where you will board a canoe and visit the highlights that this region has to offer. Giant waterlilies, dolphin spotting for the gray and pink dolphins, bird watching, piranha and catfish fishing, completed with alligator spotting in the early evening. Lunch is served in the floating observation station of the lodge “The Observer” You will return to the lodge around 8.30 p.m.
After breakfast, you will be taken to Manaus for a visit to “Meeting of the Waters”, followed with a short outside visit to Teatro Amazonas before return to airport.